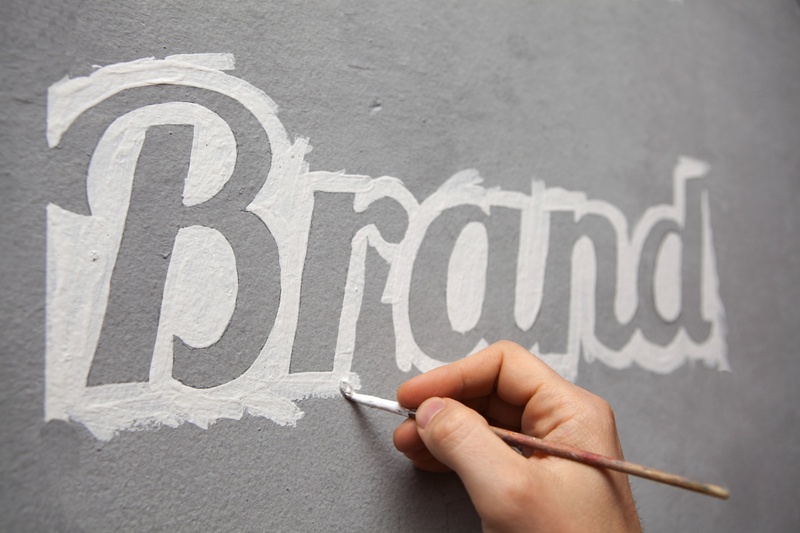 Branding is simply telling a story about who you are and inviting people to participate. Sometimes we assume that branding is a bad thing in ministry, because we aren’t trying to promote a product or turn a profit. We aren’t concerned with the bottom line, we’re concerned with the kingdom of God and people’s participation in it. But if we understand the purpose of branding and we search scripture, I think we’ll find that God cares a lot about branding. Many stories in scripture include design, architecture, textiles and construction. I’ve written an entire article about this, but one passage that stands out to me is Exodus 28:2, when God tells Moses “And you shall make holy garments for Aaron your brother, for glory and for beauty.” This conversation takes place in the context of God’s directions to the Israelites about His design for the tabernacle. God tells Moses that Aaron’s priestly clothing should have a 2-fold purpose. It is for glory and for beauty. Often, we assume that beauty conflicts with the glory of God, that to make or buy something for the purpose of beauty would be superficial and wrong in God’s eyes. But that’s not what we see here. This passage suggests that, since Aaron will be representing the very presence of God, as a servant and leader in the tabernacle, he should dress in a way that is representative and worthy of the greatness of God. everything surrounding the experience a person has with us, helps inform them about how to think about the gospel. If we believe God should be absolutely everything in our lives, shouldn’t the visuals supporting our message be excellent? So, let’s strive for excellence, not for the purpose of showing off, but for the purpose of glorifying God. Intentional photography is a great way to highlight the people, the events, and the identity of your group. Here are some creative types of photos that have been popular on social media in many churches and student ministries. Teenagers today care a lot about their style, their identity. They’re not afraid of standing out from the crowd, and they are willing to represent a cause, make a statement. With access to so many different experiences and environments, today’s teenagers celebrate more diversity than perhaps any other generation. So, developing a brand that students connect with is more difficult than ever, but it matters! Wouldn’t it be a win if your students really felt like they identified with the DNA of your group? If they felt like you get them, and like your gathering is a space specifically for them. That was one of our top priorities when we recently went through an intentional rebrand. It was one of the most personal, in depth, difficult and rewarding projects I’ve been a part of in my 4+ years at this job. I discovered that throughout the process of relaunching a brand, logo, or name, there are 4 questions that are super-important to ask along the way. 1. Why are we updating? In my opinion, logo design is one of the most challenging areas of graphic design. The end result might seem so simple, but a logo has to say a lot with just one glance. Getting colors, shapes, themes, typefaces, proportions and spacing just perfect can be quite a daunting task. 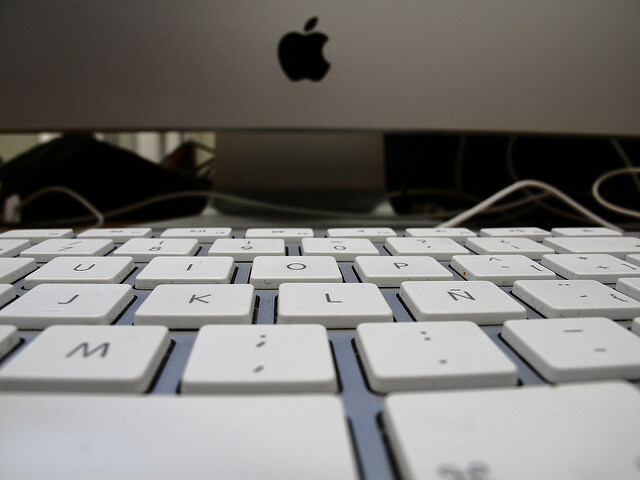 So, before you pour countless hours designing, decide what your logo should achieve. Ask yourself what you like and don’t like about your current logo, how big of a change you want to make, and what your goals are. And realize that if you aren’t ready to put the work into making a big improvement, sticking with your current logo might be better for consistency sake. During my last 4 and a half years at my current job, our student ministry branding has changed twice. When I first started this job, we had 2 different names. Middle School was called Pipeline and High School was called Axis. Some leadership changes meant that no one was super passionate or clear about their meanings. The first change we made was calling the whole ministry Mosaic Students. Mosaic is our church’s name, which has a great reputation within the community. So, switching our name to Mosaic Students said two things. 1.) We identify with who Mosaic is. 2.) We are part of a bigger whole. To reinforce those two goals, when we first switched our name, we pretty much didn’t have a separate logo. We just used the same branding as our church. Now, a couple of years later, we still want to be associated with the bigger church. But the goal for this new logo, is to help reinforce the idea that Mosaic Students is a place specifically for teenagers. A place where you can belong, where people get you, where your relationship with Christ can be experienced on a personal level. into everything they do. Their logo and physical space incorporate the idea of a loosened necktie. They do a great job of letting their purpose drive their marketing. One very tangible way of discovering your identity, recommended on Finely Crafted, is to think about what words define you (i.e. inspirational, fun, warm). Come up with these words as a team, so you have an opportunity to see where the conflicts or overlaps occur. It’s okay to actually let you own personality inform your brand. Who you are will inevitably seep out. So take some time and do some self discovery before you start designing. From there, all branding should follow the same story line about who you are and why you exist. As your branding begins to tell a more consistent story, people will be able to more easily connect. 3. What is the end goal? Ok, so once you have an awesome logo, one that is true to who you are and why you exist… what are you going to do with it? So many ministries (especially the small ones that are busy already), redesign their logo and then no one ever sees it. Make a list of everywhere your logo currently exists, and everywhere it should exist (website, social media, signage, gathering media, merchandise…) Then, make a plan for how each of those things will get updated or produced. A new logo is exciting and fresh. So, work hard to update it as well as creating some new pieces, like banners or t-shirts. 4. When is it okay to spend lots of money on getting it right? Sometimes during this process, you’ll realize that paying extra for some professional design help, or a great font, or a specialized printing method, could really help you accomplish your goals. When I’m about to spend an uncomfortable amount of money or time on something, I always try to think of the pay off. Is this worth it? For example, when I was re-designing our logo, I was looking for just the right hand-drawn, brush stroke font. Hand drawn fonts have been popular for a little while so certain styles are beginning to feel overdone. Some are too hard to read, and some aren’t bold enough to have a substantial presence on something like a t-shirt or a very small application. After lots of searching, I finally found a font I loved called Star Dust, that was perfect, but it cost $28! I know, $28 isn’t a ton of money, but for a FONT – it seemed like a lot to me (who has never paid a dime for a font). But then I asked myself how much and where we would end up using it if I did buy it for our logo. I realized that because it was so readable, yet stylized, this would probably become the primary font we would default to for everything we did. So, once I realized how impactful this font would be and how much we would be able to use it, $28 seemed like a bargain and I hit “BUY”. Another place where we spent extra time, effort, and money was on t-shirts. 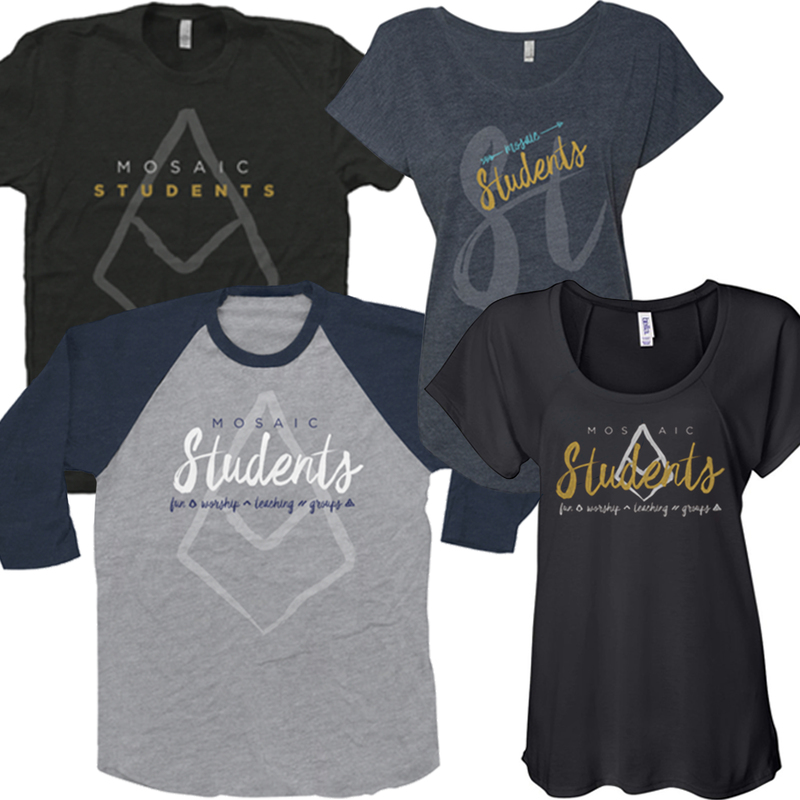 Our logo on a t-shirt was going to be the most intimate and personal experience our students would have with it. When students buy one of our t-shirts, they will take it home and hang it next to other clothes they have chosen to buy. This t-shirt will be in their laundry baskets, their bedrooms, and their gym bags. They will even decide to wear it for an entire day at a time. Clothing is important! It’s personal. It’s intimate. It has the ability to represent a personality or a style. That’s why we really wanted to get this right! So we worked hard on the graphics, spent extra money on the style and cut of the blanks, and researched a printing method that would be best for our design. Now we have a shirt that students don’t just wear because they’re part of Mosaic Students. We have a shirt that they would probably buy even if they saw it at their favorite store next to a hundred other great options. Your volunteers will be passionate about your vision if you consistently share the why behind the what. If you’re willing to train volunteers on the exact expectations of their job, you should also be willing to share the reason for those expectations. 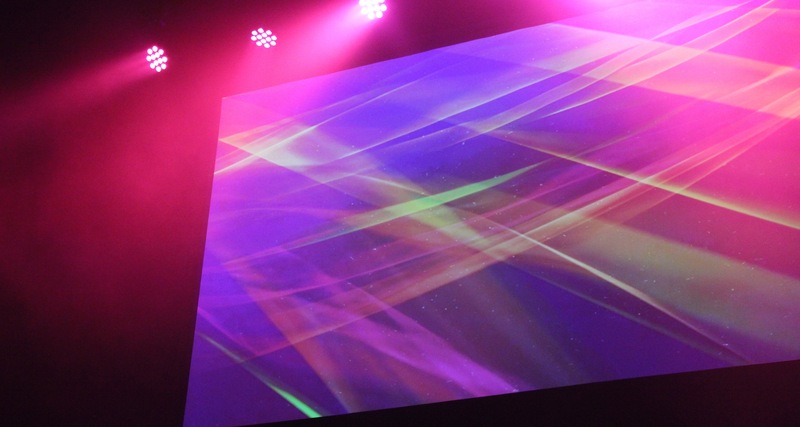 For our church production team, a high priority is to minimize distraction so that people can freely engage in worship or focus during the message. Because of that vision, we train our volunteers to make transitions smoothly and during times in the gathering that feel most natural. Let’s remind our team that what we do matters because of why we do it. And even beyond what we do in gatherings, we can remind our volunteers that anything they put their hands to can glorify God. Scripture teaches us that God regularly uses man to display His wonder through craft and creativity. See my article Creativity: For Glory and for Beauty. What a great privilege it is to partner with Christ in reflecting His beauty to the world! Ask yourself, “If one of my team members had to describe A+ level service on my team, would they know what to say?” Do your team members have clarity on what the WIN looks like? Feel free to set the bar high (at A+ level). Then, remind your team that perfection isn’t necessary, but doing their absolute best is a way to serve Christ’s bride. If it’s helpful, write down some expectations together as a team and then display them for everyone to use in self-evaluating. We have about 10-15 Middle and High School students (as well as 2 interns) who serve on my production team for weekly Student Ministry gatherings. 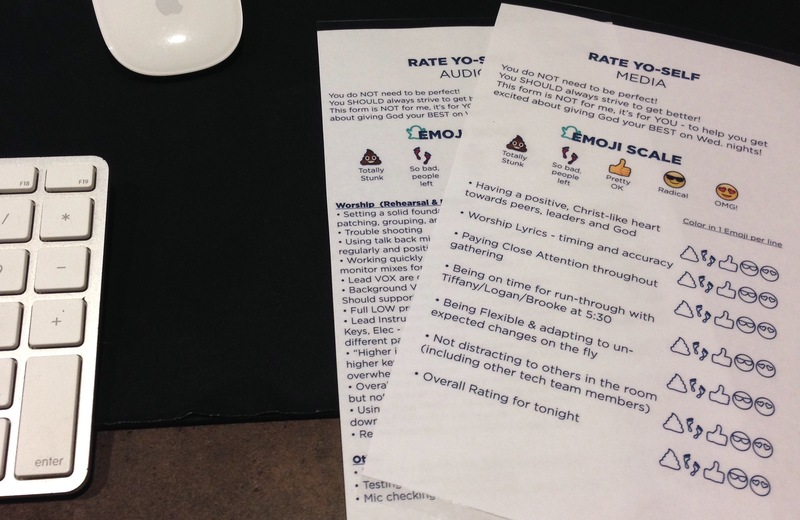 Recently, an intern and I developed a “Rate Yo-Self” form for team members to fill out after each gathering. The form is complete with a list of expectations, an emoji scale, and a reminder of the purpose of the form. The next time they serve, they get to see their form and remember in what areas they can improve. This is just one example of a way to remind your team exactly what the win looks like. Has this ever happened to you? You feel like you’ve built up your volunteer team well and you can relax for awhile on recruiting. So, you let your guard down for a little while and all of the sudden, you have no volunteers! We’ve all been there. During a busy season or a transition in leadership, you stop recruiting for a second and the ship sinks! This has happened to me and other co-workers enough that I now realize recruiting can never be put on the back burner. People move, they go through craziness at work or home, they start serving on other teams, or your church’s production needs increase. We can’t afford to take a break on recruiting, while people’s real lives keep going. In Andy Stanley’s book, Next Generation Leader, he teaches young leaders to “Only do what only you can do.” If you’re leading a team of any kind, recruiting and training is probably something that only you can do well. Carve out more time than you need for recruiting, training and maintaining. Then, become unwilling to let any other responsibility take its place. One last point I’ll make before I get off my recruiting soapbox. Don’t just recruit for new team members, but also recruit for higher skilled team members. On my volunteer team, I have 3 different tiers of responsibility. To staff my gatherings appropriately, I have to always be looking out for the people who show potential to move up. If someone is doing an excellent job or they have passion for learning something more advanced, I take note. Then, I share some encouragement, goals, and incentives with them. Anything from learning a new skill, to getting to serve in more gatherings, to… CANDY can be effective incentives. Volunteers at higher skill levels can be the most difficult to replace, so always be training up your current team to move forward. 4. Decide what you expect from your team and then be consistent in protecting them. To me, this also falls into the “only do what only you can do” category. If you are a production team leader, you are in the best position to understand the skill level of your volunteers and the needs of your church. You are also in the best position to help the leaders above you understand the capacity and limitations of your team. You can and should act as a liaison between the team you lead and the leaders above you. Make sure your team and your church are set up to win each week. Scenarios where I feel I need to protect my team often occur around the games we plan for our weekly Student Ministry gatherings. Sometimes a great idea for a game requires that the person running media cues a sound effect in a split second or reveals an answer to a trivia question on the spot. In moments like these, any delay can cause awkwardness and distraction in the gathering. When possible, I try to work towards a solution that allows either our staff communicator or the game participants to be controlling any split-second reveals. Your leaders will respect you for positively moving towards a solution, and your volunteers will appreciate you for not asking them to take on responsibilities they aren’t trained for. 5. Don’t forget that you are partnering with God. When you get in the thick of your pre-gathering prep or the busiest season of your year, it can be tempting to just put your head down and get stuff done. But, stopping to ask The Creator to give you the inspiration, direction, and energy to lead your team well is absolutely essential! I went to college for architecture and one time I had a project I was working on that just totally stumped me. It was a design studio project and I felt like I just had creativity block. Everything I tried seemed forced. One late night in the studio before a big presentation, I was super frustrated. Then I thought, “I feel like I’ve tried everything, but have I even tried asking God to help me be creative?” So I prayed (almost jokingly – not expecting it to work) and within 10 minutes I had overhauled the design, and come up with a great idea that would drive the entire project. I don’t think that praying will manipulate God to give us anything we ask for. God is not our butler! But, I do think sometimes we just need our Creator to breath life and inspiration into our work! I wholeheartedly believe that an intimate relationship with God makes me a better creator and leader. I don’t know how many times I’ve had my volunteers cancel last minute, or a piece of equipment fail shortly before a gathering, and I’ve had to cry out to God on behalf of the students about to walk through our doors. Our best work is done when we partner with God, realizing that even our best efforts will pale in comparison to a joint effort with Him. He desires for us to participate with Him in the redeeming work He is doing in the world (not the other way around). It’s such a privilege to get the opportunity to do creative work on behalf of our Father. And, honestly, I can’t think of any area in the church I would enjoy serving in more than production! For those of us who enjoy technology and creativity, this work is FUN! Let’s remember to celebrate that regularly with our teams. As a leader, your demeanor can have a huge influence on the mood of your team. So make it an absolute priority to discuss life with your team, play games with them, acknowledge them on social media, joke with them, and celebrate with them after a job well done. If you’re anything like me, forgetting to intentionally prioritize the FUN will cause you to let it fall through the cracks for months at a time. Sometimes the weight of our responsibilities or the urgency of our tasks can take our focus, but bringing back the fun can re-energize you and your volunteers. In church, sometimes we think branding is a bad thing because we’re not selling anything to a consumer, we’re sharing the truth of the gospel. But what most people don’t know is that the brand story of any company is essentially just their answer to this question. What an important question to ask ourselves in ministry! Just like any company, we are sharing a message and displaying a reality. We don’t have a product, but we are presenting the hope of the rescue, redemption and restoration that knowing Christ offers. What’s also crazy – once someone buys into following Christ, their identity is effected. The best brands strive for that outcome. Being redeemed by God means you are an adopted son or daughter of the Creator of the universe. It means you are new, valuable, righteous, and eternally secure. THIS is a story worth presenting well! Your brand story is also something worth communicating to your teams with consistency and clarity. If your leaders and volunteers have clarity on why they think the ministry work you do is essential and effective, you will be more unified as you point to Christ together. If you have clarity on ‘the why’, it will help inform and shape ‘the what’ (i.e. the series you speak on, the music you play, the things you hang on the wall, the special events you plan, the way you train your leaders, your name and visual presence). Whether you know it or not, you already do branding in your ministry. To ignore it as a priority probably just means you are doing it poorly. 1. Do what the best brands do. The best brands actually aren’t promoting their product, they’re promoting their identity. Companies like Nike and Apple market what it says about you if you identify with their name. That’s why Nike’s motto is “Just do it”. It’s not just about the equipment needed to perform athletically, it’s about a way of life, an attitude, an identity. In 1983, when Steve Jobs wanted to bring marketing genius and Pepsi CEO, John Sculley onto the Apple team so that Jobs could focus on product development, he delivered what’s known as the best elevator pitch in history. First he tried to get Sculley on board with his persistence, stock options and a huge salary increase. But when that didn’t work, he asked him the questions that would gnaw at him, keep him up at night, and ultimately cause him to leave Pepsi and join Apple. “Do you want to spend the rest of your life selling sugared water, or do you want a chance to change the world?” Steve Jobs turned Sculley’s focus away from the product of Pepsi to the identity of being a world-changer. Likewise, we want to steer people away from experiencing church as a product, and steer them towards identifying with their new life and family in Christ. Once their identity has changed, church isn’t just about Wednesday or Sunday, it’s about every area of life. Branding in ministry isn’t about attracting people to a product they like, it’s about inviting people to be apart of a new life in Christ. 2. When someone leaves a service or gathering, they will leave with only one primary takeaway. With a little bit of planning and foresight, could your gatherings have a more cohesive directive? Think about it. Every time you meet, there is the potential for people to encounter several conflicting messages. They experience lobby signage, a welcome, possibly a video or two, a call to worship from the worship leader, several worship songs, a message, and announcements. And each of these elements are most likely calling your people to some kind of response. What if there was a common thread through all of these elements, so that as people go home and process that content throughout the week, they have clarity on what to focus on. Let’s not assume that people will focus on the thing we spent the most time preparing. The reality is that people will focus on content that 1.) reoccurs throughout the gathering 2.) gets the most airtime 3.) has the strongest visual presence 4.) is simple and catchy 5.) happens last. 3. Our brains are wired to recall things when associations can be made. This means that if what we see, hear, sing, and feel are all associated, the impact will be stronger. I have a friend who is phenomenal at remembering names. And, because of his job, he meets hundreds of people a year. One time I asked him about it, assuming that he just has an impeccable memory. I’ve always been poor at remembering the names of people I just met and always blamed it on my bad memory. He told me that he actually has a terrible memory too and even struggled in school because of it. But he has a trick to help him remember names. Whenever he meets someone new, he makes it a point to find out as much about them as possible within the first minute of talking with them. He repeats each new fact back to the person as his bank of info increases. “So, Mallory, you’re 20 and you grew up in Florida? That’s really interesting that the rest of your family lives in Ohio and you’re going to nursing school.” He told me that once he has done that, anytime he sees that person in the future, if even one aspect of that conversation come to mind, he can usually make associations to the rest of the conversation (including their name). I help plan my church’s Middle School and High School gathering each week. Most messages we preach are part of a series of messages with the same theme. Each series includes a catchy name, a series intro video to kick off the night, a pre-message bumper video, a slide/graphic, small group questions and even recommendations for music and social media posts. If all of these elements have a common theme, then anytime one element comes to mind, we are more likely to remember other elements of that series. For example, three months after a series, a small group leader might ask her students if they remember the illustration our pastor used during the Propel series. Saying the word Propel is most likely going to bring to mind the graphics and videos from that series, which might help them recall the illustrations, bottom lines and scriptures. If visual elements and message illustrations don’t exist or they are incongruent, people will be less likely to make those connections and remember the core content. Instead of creating isolated experiences for people, let’s aim to give them clear directives with a common thread. 4. Realize that people are only experiencing this gathering for a short amount of time once a week. I will admit that for years, I was definitely guilty of assuming that if we’ve played a worship song two weeks in a row, it’s played out, or if we’ve announced an event 3 times, people are tired of it. For those of us who spend countless hours planning and discussing our gatherings, it can feel like people need completely fresh content every time we gather. But the reality is, your people just went a whole week without hearing about any of the stuff you are talking about all week long. Strive to over-communicate your message, making it easily accessible through multiple avenues. And don’t be afraid to clarify, repeat, and repeat again saying it differently. People have a ton on their minds! Do them a favor by over-communicating the most important content. 5. Tangible experiences are more impactful than simply hearing a message or reading information. Throughout Scripture, we see God tying tangible actions or visual reminders to teaching. Often when Jesus taught, he used metaphors with everyday items like seeds, trees, sheep, a lamp, a door. He tied spiritual lessons to everyday experiences to more actively engage people. Communion is a great example of this. Jesus taught His disciples to use the acts of drinking wine and eating bread to remind them of Him. Wine represents Christ’s blood and bread represents His body. What a beautiful way to tie an action, a taste, and a symbol to the memory of Christ’s sacrifice. These little directives can remind us of big truths. In ministry, we can offer people visual illustrations or tangible challenges to more strongly drive home our message in a relatable, memorable way. 6. We are part of a culture where fresh trends come along faster than new superhero films. As devoted followers of Christ, we probably know that the gospel never goes out of style. The message of Christ, the personality of God and the relationship we get to have with him never gets stale. But, if we’re not careful, we can present the gospel to others in a way that seems outdated, irrelevant or lame. And I’ve often wondered if that does justice to the message Christ brought to the world. Throughout scripture we see Jesus and His disciples contextualizing their message to the culture, not in a way that diminishes it’s truth, but in a way that increases its relatability. So, practically, what does this mean? It means, do your research before you implement a stage design, print a t-shirt, redesign your website, prepare a message for a different campus that you’re not used to, or name your youth ministry (or not name your youth ministry, since we’re not in the 90’s anymore). Find out what other churches are doing, what’s been overdone, and what’s ‘in’. Or better yet, hire creative, passionate Millennials who are in touch with pop-culture and think innovatively about how to do church. Then run things by them regularly. Collaboration is your best friend when it comes to trends, styles, and staying relevant!